I watch an awful lot of anime that can be described, charitably, as “vapid”, and I feel a little ashamed about this sometimes. On the other hand, I’m usually watching anime to give me something to take my mind off the fact that I’m working out, so I figure that it’s OK to occasionally binge on yet another high school love-quadrilateral comedy or angst-filled mecha drama. Psycho-Pass is, therefore, something of a change of pace, because it’s a serious cop show with very little romance in a Gritty Dystopian Future setting. 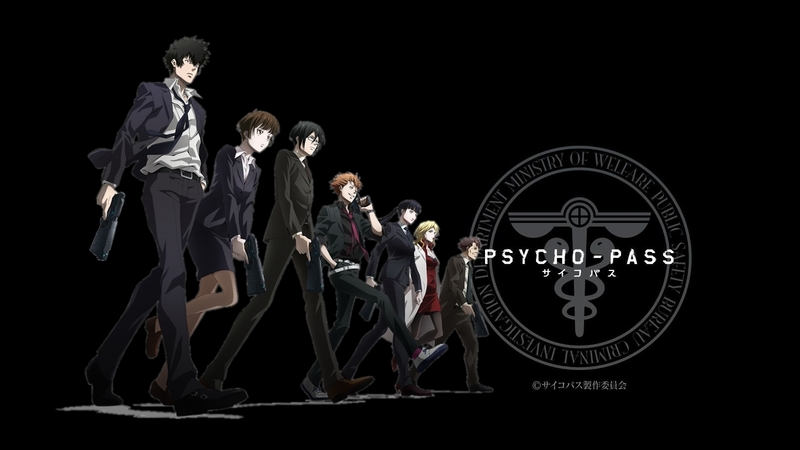 The “hook” to Psycho-Pass is that, in the ambiguously-close future, we develop the machines capable of reading and evaluating your mental state instantly, and where people are constantly psychologically evaluated as they go about their daily business. Your potential is determined at a very early age, and your career options are given to you by a computer based on what you will be happiest doing. As a result, daily stresses such as worrying about your future are largely eliminated. Privacy is basically gone but that’s just the price you pay to live in an ideal world. People who are deemed latent criminals – that is, people whose crime coefficient can’t be lowered to socially acceptable levels through therapy – get locked away as they are unfit to associate with normal society. This can happen quite early, and one character comments that he was determined irredeemable at the age of 5, but it generally doesn’t happen until you’ve been exposed to an awful lot of terrible things. Quite a lot of police detectives, in fact, tend to wind up in the irredeemable criminal group and get locked up, just as a side effect of their job. I’m not going to shock anyone, I think, by mentioning that the entire perfect computer-controlled society has a Dark Mysterious Secret, and that the main character is a rookie inspector who eventually and inadvertently stumbles upon The Grand Conspiracy. What DID shock me was the way that the show uses its “This is all an alternate future and it’s totally 100% fiction” setting as a shield to bring up rather serious topics that modern Japan is dealing with. Pervasive monitoring, people retreating online and no longer interacting with society, the benefits and disadvantages of guaranteed employment, immigration, self-sufficiency as a tiny island nation, elder abandonment… it’s kind of a shame that I’ve graduated, because I could get SO MANY paper topics from this show, it’s not even funny. Of course, you can flat-out ignore the social commentary and just watch it as a pretty cool show with lots of action, because it’s good like that too.